The 6.5' Vello Off-Camera TTL Flash Cord provides creative photographers with the ability to remotely fire Canon flashes with E-TTL / E-TTL II capabilities. Removing the flash from the camera's hot shoe allows the photographer to create unique and dramatic lighting styles that are not possible with a traditional shoe-mounted strobe. This coiled cord measures 6.5', which accommodates shooting with the flash mounted on a lightstand and with an umbrella, while staying in close proximity. Also, off-camera lighting reduces the harsh shadows commonly encountered with direct on-camera flashes and gives your photographs a more natural look. One side of the TTL cable fits directly into the camera's hot shoe to ensure that all of the camera's exposure data is maintained. The other side can be attached to any stand, tripod, or device with a standard 1/4"-20 threaded stud or flash shoe mount, and the shoe has a locking knob to ensure your equipment is secure. Box Dimensions (LxWxH) 7.1 x 3.3 x 2.0"
Off-Camera TTL Flash Cord for Canon Cameras (6.5') is rated 4.7 out of 5 by 169. Rated 5 out of 5 by shenko from great cost effective product I am a wedding photographer and one ofbthebworst things is shooting outdoors at night with on camera flash. The cello cable allows me to take my flash off camera and gives me far more versatility whilst keeping the ettl function operating. What I like about it is that its cheap, well constructed and has a weather sealing flap that is perfect for my canon semi pro bodies. I don't see how you could get a better option than this. I have used other off brand cables and they feel flimsy in comparison. I think this is a good buy but ultimately time will tell. Also it gives you complete control over your flash just as if it was connected to your hot shoe. Rated 4 out of 5 by bslphoto from Get your flash off the camera I bought this as an affordable approach to getting my flash off of my camera. I have been in situations where I didn't have enough room to take the angle I wanted because the flash was in the way. I also don't usually like the results of the flash right over the lens. My next step is to get a couple of Pocket Wizard transceivers. I can't wait to have complete freedom with portable lighting. The biggest downside is the design. The cord comes out the same direction as the lens. It would be a benefit to have it on a swivel so that the cord could easily lay to the right or the left or where ever it was needed. A locking swivel so you could pin or lock it into a specific position would be ideal. Rated 5 out of 5 by Walt from Works with Fuji X-Series Cameras Yes, this off-camera TTL flash extension cord works perfectly with the Fuji X-T1 - and probably others in the Fuji X-series as well, but I don't have any of the other X-series to test it on. Slides into the hot shoe, and you place your Fuji flash or the wonderful Nissin i-40 Fuji-compatible flash on the other end of the cord. Magic happens, full TTL control and off-camera flash. What more could you want? Rated 5 out of 5 by Ronald W. from Very Well Constructed The cable is heavy duty with good strain reliefs at both ends. The plastic housings are also study. I am replacing a cable whose plastic shoe for the flash broke immediately upon use due to the flash head weight and flimsy construction. This one is much more solid. However, I recommend that you disassemble the flash shoe (4 screws) and use super glue all around the housing joint to keep the housing from cracking with a heavy flash head. I don't think this housing will crack like my old unit (different brand) did, but I'm not taking any chances with an expensive head hitting the floor. Rated 5 out of 5 by Jason M. from Does Its Job A more affordable alternative to Canon's versions of the off-camera cords. Maintains perfect communication between the camera and the flash unit, and the build quality seems strong enough that it should last a while under heavy use. Generally I have my flash mounted on a tripod and use it that way, but works fine with a flash bracket too. The only real complaint I could make is that the cord protrudes forward off the camera mount and so often seems to find its way in front of my lens while shooting. I wonder if having the cord protrude upward would make a difference? But it's at most a minor annoyance and probably par for the course when working wired anyway. Rated 3 out of 5 by Andy Ottawa from Pearstone coiled flash cord The cable is solidly made and well priced; it has a quick quarter turn lock to secure it on the camera. It is labeled as 6.5 ft, but in fact it will only reasonably stretch to about 4 feet. This remark would be applicable to any coiled cord, not a deficiency of just the Pearstone design. One problem of coiled designs is by the time you stretch it a few feet, it's pulling quite hard on the camera and can turn the camera, tilt the tripod, etc. So for a coiled cord design I'm happy with it but a wireless unit would be a better choice if the flash is more than two or three feet away. Rated 5 out of 5 by Michele in WA from Fantastic Find! I am so happy that I researched and found this cord. Reviews of other off-camera cords weren't very positive, and the Canon brand was not only expensive, but seemed just way too short to be of much use. This cord is a great length for what I will be using it for, and the construction feels strong and secure. The lock on the camera/hot shoe end is an added bonus, and the flash end locks on with the flash lock. It was a little tight getting onto the flash, but once on feels very secure. Has so far worked flawlessly, stretches well, and was just the right size at the right price. Rated 5 out of 5 by Anonymous from Just needs some time to be broken in. Straight out of the box this cord is 3' in relaxed state and can be stretched to 6.5' with some effort, but you would risk pulling over your equipment (the cord is heavy.) Expect to get about 5' with minor tension right away. However, the cord is much more supple than I expected from other reviews so with some use I'm confident it would deliver on the 6.5' without a problem. I currently only use it for handheld off-camera flash and I'm glad I opted for this instead of the shorter version, just to have the versatility. Works great, has the lock and can be mounted on a tripod. Will this work between Canon T6 and Sunpak DF4000u? While it is not a combination that we have tested, we see no reason the cable will not work with that camera and that flash. Is this cord compatible with The Canon EOS 60D and the Canon Speedlite 600EX-RT? Will this work with a sony a7sii and a nissin i40? No, it would not. 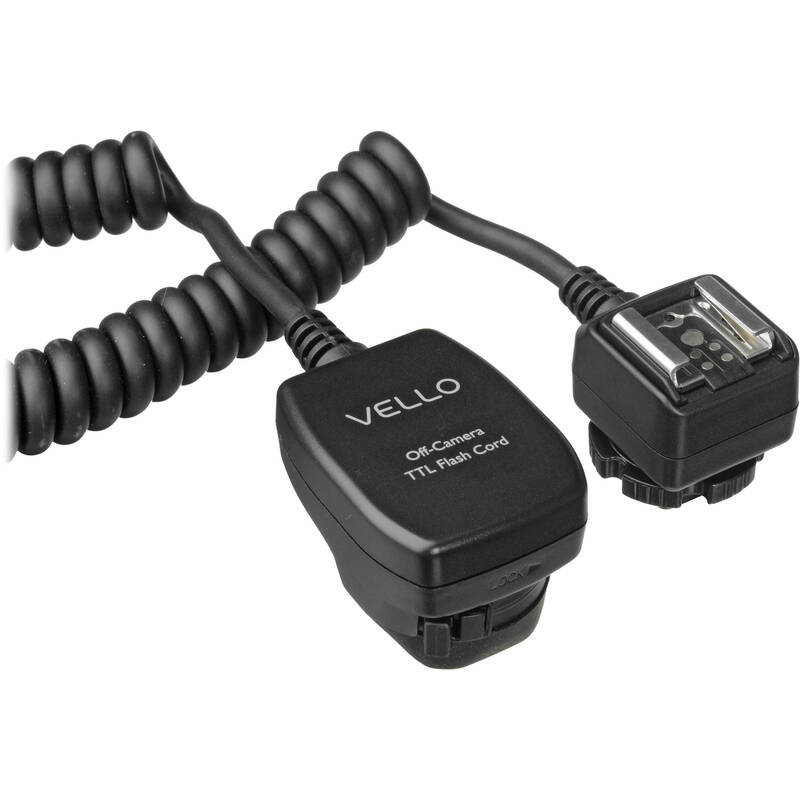 As the camera and flash you list above use the Sony Multi-Interface Hot shoe, not the Canon E-TTL II Hot Shoe, the Vello Off-Camera TTL Flash Cord for Sony Cameras with Multi Interface Shoe (6.5'), B&amp;H # VEOCSSMI6, would instead be the cable recommended for using the Nissin i40 Compact Flash for Sony Cameras with Multi Interface Shoe with the Sony Alpha a7S II Mirrorless Digital Camera. It will work as a trigger-only cord for any standard hot shoe (including Fuji), and it has a 1/4-20 socket on the flash end for mounting on a light stand. It works TTL with Canon-compatible gear, but I don't think TTL will work with Fuji. For that a Fuji-compatible TTL cord and TTL flash would be required. Does this third-party Vello cable work reliably with the Canon 5D Mark IV? I've had good luck with mine. It's not a cord I use daily but I haven't had any connection issues and everything works as it should. Can we use this cord with HSS on Canon Speedlite 580EX II off the camera? I have used this cord with the 430EX II, 580EX II and 600EX RT for a long time. I have not discovered any limitations of the cord. I use it with Canon 5D III, the original Canon 5D and a Canon 60D. I am assuming HSS refers to high speed sync. Because I am not certain exactly what you are referring to by HSS, I'm not sure if it will work for you. I have not tried the cord with high speed sync. Very sorry I can't be more helpful! Can I use this cord with a 550EX Speedlite and a Canon 20D camera? Yes, it has contacts for Canon cameras and flash.I use mine on a Canon 7D and 5D with no problem. Unfortunately we are not able to provide you with the shipping weight of orders until after the point when they have shipped out. The best I can provide you with is the pre-packaged weight which is 9.6 ounces. The packaging should not increase that much.